Students at TCPS are well aware that not everybody lives a privileged lifestyle. Students are taught that they don’t own the world but share it collectively with others. On this premise, TCPS students enthusiastically participate in many charitable fund raising events throughout the academic year. The immediate beneficiaries are people in need at the Markham Stouffville Hospital, local food banks, the Veterans Association of Markham, the Canadian Red Cross and the Heart and Stroke Foundation. Annually TCPS participates in the Jump Rope for Heart and Hoops for Heart event with proceeds benefitting the Heart and Stroke Foundation. All elementary students spend a few hours in the gym to test, practice and perfect their skills. The grade 1 to 4 classes rotate through a variety of stations incorporating jump rope activities. Grade 5 to 8 classes take part in dribbling, passing and shooting basketballs, while raising funds for this healthy heart charity. 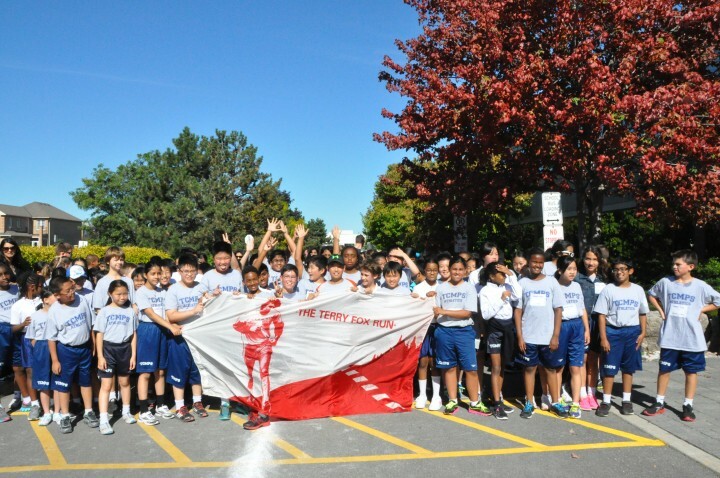 All students from Town Centre Private Schools participate in the Terry Fox Run with proceeds going to the Terry Fox Foundation and cancer research. Students from the Montessori Pre-School to grade 12 take turns running, jogging or walking outside the school in a gesture of goodwill and respect for this Canadian icon. This has become a popular event held every September. To wear a poppy shows respect and remembrance of the sacrifices made by soldiers and their families, both in recent years and in the past. The Remembrance Day Poppy Drive is an annual event at Town Centre. Each year all students are provided with a poppy and a small envelope for a voluntary contribution. During the weeks leading up to and on November 11th, the students wear their poppies with pride in honour of those who have enabled us to enjoy the freedoms that we have. We are pleased to present an annual donation to the Veterans Association of Markham. The elementary Student Activity Council and staff of Town Centre Private Schools presented the pediatric ward of the Markham Stouffville Hospital with a collection of toys and a financial donation. Toys donated were part of a school wide toy drive and monetary proceeds were raised through a school charity event. In addition to the Christmas toy drive, parents, students and staff contribute a number of non-perishable food items during the Christmas season. All food items and donations collected are donated to the Markham Food Bank to assist those in need in the community. As a part of Earth Day activities each April, the TCMPS grade 8 classes, elementary Student Activity Council and elementary Vice-Principal, Mr.Lamanna visit Highgate Park and collected garbage. It is gratifying for the students to be personally thanked by Ward 8 Councillor Alex Chiu for “pitching in” to help keep Markham beautiful. TCMPS continues to be a proud City of Markham supporter!